When I got invited to be the MC for the very first Danitrio Maki-e event in Southeast Asia, I can bet all my best fountain pens that I was delighted as a child on her birthday. Okay, I take it back. I’m not going to bet all my best fountain pens. But believe me, being busy and tired all the time from work, this was a very welcome “spice” in my life! My job was not so difficult, basically I needed to appear looking presentable, and I have a script that I’ll need to read from to introduce the event and the owner of Danitrio, Mr. Bernard Lyn. I had the script, a nice dress, an excellent mood, and I was good to go for the exhibition! This was a closed event so clearly I felt even more privileged to be part of it. I knew some of my SFPL friends were going and was totally looking forward to it! I went down to the function after work, revised my script and got reader to enter the function room. 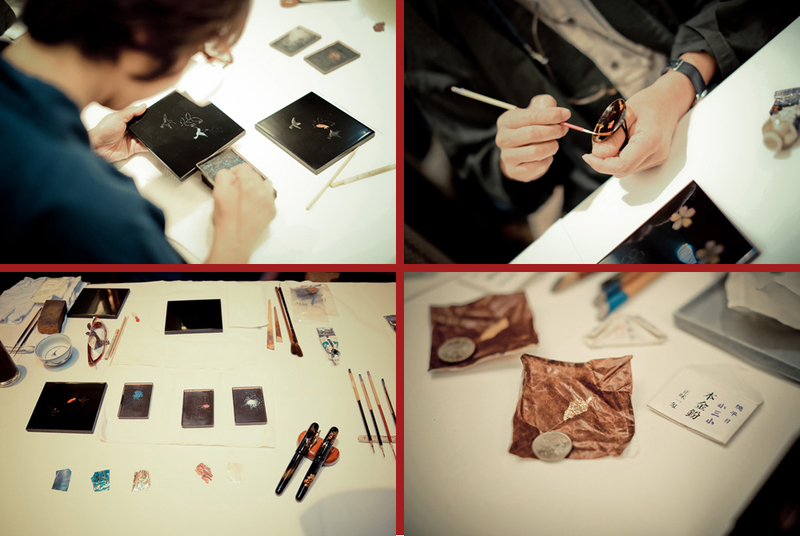 Maki-e masters Mr Todo Tatsuya and Mrs Todo Wakako hard at work… look at the fine coloured powders used for the art! They are laid on very thin paper and coins are used to press on them to hold them in place. There are also pain colours and tiny brushes are used to make very fine strokes on the pen body. Some of the guests were even offered a chance to try out the painting by themselves! After the guests were wowed by the maki-e demonstration, I welcomed Mr Bernard Lyn, founder of Dani International Corp., to come up and give an introduction to the art of Maki-e.
And this picture… I bet it’s something everyone is looking forward to viewing! Look at all those pens on display! We could touch and feel them, and even try some of them out. Such wonderful works of art! The highlight of the evening was the Danitrio 100 Kids Maki-e pen (picture below), a masterpiece designed by Mr Todo Tatsuya himself (signed as Kosetsu)! Such an animated picture of joyful children playing around, covering the entire body of the pen. It’s a beautiful masterpiece and limited to only 19 pieces worldwide. So if you own one of these, you have to cherish it! Our evening ended with excellent food and everyone was really happy, as you can imagine. We even had a door gift each, which is a Paperblanks notebook bearing a picture of the Danitrio 100 Kids pen on its first leaf. I managed to get an autograph each from Mr Bernard Lyn and the artist, Mr Todo Tatsuya himself! <img class=" size-full wp-image-2046 aligncenter"
How did you get invited to such events? I must ask Danny the next time I see him! Haha yes they are fun. I’m pretty lucky!